As agreed upon between the company and the members the collective agreement has benefits negotiated and a summary of the provided coverage can be accessed here. Your collective agreement sets out your rights and responsibilities at work. If you have any questions or concerns about your treatment, please talk to a member of the executive. Please report to the Company and the union if you are unable to complete service and/ or schedule sufficient crew rest on long range flights. Please give us a schedule of how long the service took and and any further details on flight, such as equipment failures that prolonged service, turbulence, passenger issues, medicals, crew complement, etc. duty periods from 15 hrs to 16h15 are entitled to 4 hrs. duty periods from 17h11 – 18h00 are entitled to 4 ½ hrs. Meal breaks are to be taken separately from the on board crew rest. The Employee and Family Assistance Program (EAP) offers confidential assistance to employees and their dependents experiencing personal problems. 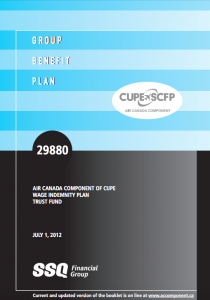 The EAP is jointly sponsored by Air Canada and the unions. Why do we have a program? In any organization as many as 10% of employees may be having personal problems, which can significantly affect various areas of their lives. In addition to the stress placed on the troubled individuals and those closest to them, the ability to fulfill their work responsibilities may be affected. The management and unions of Air Canada recognize that the majority of human problems can be resolved and the negative effects reduced. The EAP offers help to employees in identifying solutions and working toward them. Everyone concerned can benefit from positive resolution of problems. The purpose of a Grievors statement is to note full details of an incident in writing. Details including dates, times, places, names of individuals involved and all other facts relating to the case. The answering of the who, what, where, when and why. Try to put statements in the form of quotes, focusing on factual events rather than perspective of what ‘he said/she said’. Ensure to sign and date this statement, as well as provide any relevant documentation regarding the incident. What are my time limits for making pay claims? All pay claims regarding the incorrect awarding of open flights must be filed within fourteen (14) days of scheduled departure (B7.06). All other pay claims must be submitted within fourteen (14) days of your becoming aware of the error. If you file a claim, the sixty (60) day time limits (Article 13.02) start to run as of the date that you receive the Company’s response to your claim. Note 1: If you do not receive a response from the Company within thirty (30) days of filing a pay claim, file a grievance. If you do not file a pay claim, the sixty (60) day time limits (Article 13.02) start to run out as of the date that you become aware of the alleged error. Note 2: The time limits found in Article 13.02 do not include Saturdays, Sundays and statutory holidays. How long do I have to claim for missing or erroneous meal expenses? Meal allowance grievances are handled through a separate dispute resolution process and the time limits for filing those claims is twelve (12) months from the date of underpayment. If you believe there has been a violation of your rights under the Collective Agreement and you are unable to resolve it with a supervisor, you have sixty (60) days (excluding weekends and statutory holidays) to file a grievance. Grievances that are not filed within the above timelines run the risk of being dismissed by the Arbitrators. What do I need to bring with me when filing a grievance? Please keep a copy of all documents that you provide to your Local Union Office or the Company.What do I do if I disagree with Crew Scheduling about my rights?Explain your right and quote the applicable article from the Collective Agreement. Request that the crew scheduler abide by the Collective Agreement. Always write down the date, time and name of the Company representative. If unable to agree, cabin personnel are required to work now, grieve later. If you become aware of any disciplinary measures being levied against you by the Company (including but not limited to a letter of reprimand / suspension/ discharge) you must notify us so that we can file a grievance within ten (10) days of receiving the Company’s decision, excluding weekends and statutory holidays. Grievances are filed at your Local Union Office with the help of your Local Officers. REMEMBER: You have the right to Union representation in all meetings with Management. 124 Every Employer shall ensure that the health and safety at work of every person employed by the employer is protected. 126(1) (g) While at work, every emmployee shall report to the employer any thing or circumstance in a work place that is likely to be hazardous to the health or safety of the employer, or that of the other employees of other persons granted access to the work place by the employer. PBS New U.I. vs Old U.I. All full-time members are part of the Air Canada Pension Plan. 7. You can run different retirement dates. Different pension amounts and options will be displayed as applicable.These different scenarios can be saved for later viewing. We encourage all pension plan members to use this guide to access your pension plan details and familiarize yourself with your greatest benefit. The more information and knowledgeable each of us have, the more prepared you will be to make decision about your pension. All pension inquiries are now handled by Mercer call center representatives.